This listing is for a cape/vest that attaches to a harness. A HARNESS IS NOT INCLUDED. This cape offers plenty of room for patches and the pockets are the perfect size for cell phone, wallet, medications, etc. 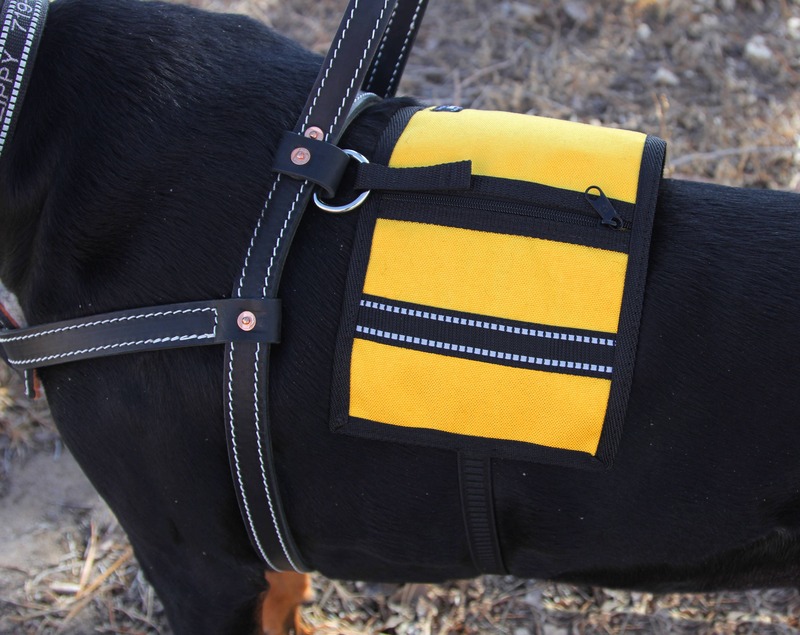 The highly reflective stripes on the sides of the vest keep your dog visible should you be out at night. The attachment straps are set approx. 7" apart and are designed to loop through the D rings on many different working dog harnesses such as Activedogs (shown), BLD, Finely Tooled, Yupcollars and many others. Please read carefully and choose desired color and style in drop down window. This item will be custom made in the color and style you choose. Choose carefully as custom work is not returnable. No exceptions. Vest size 6 1/2" x 19"
Elastic girth strap adjusts from 27" - 33" before stretching. Beautiful, high quality cape and the shop owner was lovely to work with. This is a gorgeous vest, very sturdy. I ended up changing my order to navy blue and the color is just perfect. My dog looks very professional. The pockets on this vest are not very big but will hold what I need in terms of papers, wipes, doggy bags, and a collapsible bowl. I love the design and the elasticity of the tummy strap makes it comfy.